The web has become an essential place to go for research, connection and commerce. Even in niche B2B markets; even for products & services that can’t easily be sold online; even for companies with no web footprint. Many in B2B media are transitioning from a print-centric world to a web-based ecosystem, as are their partners & advertisers. But how much do each of these businesses factor the web into their core business model? Is a magazine brand selling web ads as it would print ads, or is it creating sophisticated lead-generation programs, and rethinking their data warehouse as a premium content offering? For those who partner with B2B media, are advertisers asking "what can we do in social media" or are they reframing all of their research, marketing, events and customer outreach to include the web as a core component of a single system? More and more, I am finding that all roads lead to the web. Today I want to take you through a process that is meant to illustrate how ingrained the web has become in our research, buying & communication processes – and how it is extending to affect offline activities. The example below is going to seem silly, but as I went through each step in the process, I was constantly amazed at how useful the web was in enabling offline activities. 18 years ago I bought my first guitar, and spent a few years noodling around and making loud noises with it. This winter, after a long gap in touching a guitar, I decided to learn to play properly. So this is the story about how the web factored into every step of me picking up the guitar again, and how different things are today than they were 18 years ago. At each phase, I will share broader lessons, considering how a business can leverage these behaviors. Overall, I can’t help but feel there are lessons in here for the future of B2B media, and how advertisers & businesses serve these markets. How do those in your industry get new ideas for marketing, product design, or customer trends? Oftentimes, bursts of inspiration are fleeting. I would argue that increasingly, the web is a key tool in not just finding inspiration, but also to fan its flames. My moment of inspiration for picking up the guitar again was watching the movie "It Might Get Loud," which featured The Edge from U2, Jack White from the White Stripes and Jimmy Page from Led Zepplin. 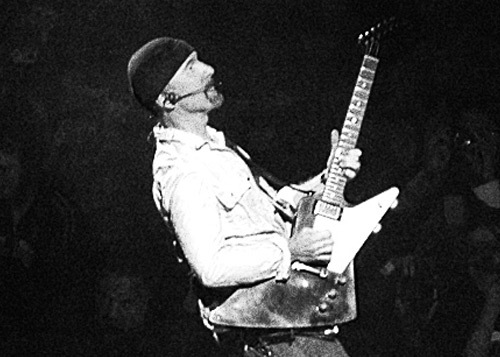 A detailed look at Edge’s guitar workshop, his many guitars and effects system, and he takes us through how famous sounds from U2 songs are made. For me, it broke down that big huge sound into something humble and small – a guy in a room toying with these instruments. That is something I could relate to. A walk around around New York City with The Edge, going into guitar shops and talking about the instrument and how he came up with some well known riffs. These are stores I have been in, and it was nice to see how different the experience is when you actually KNOW how to play properly. A simple look at a day that The Edge & Bono spent in Miami while on tour. It takes you behind the scenes of their stage setup, and a few quaint moments. Having a repository of videos like this on YouTube gives you immediate and persistent access to inspiration. When I was a kid, I can remember coveting the meager amount of media I could find about a favorite musician, staying up late for music videos in the early 80’s, and seeking out magazine articles from Britain. Information was rare and oftentimes expensive. No longer. How do people in your market find new ideas and inspiration? How do they take the first tentative steps to pursue these ideas and vet them? Chance are, the web factors into this process, in order to identify benchmarks, competition and viability of a potential new initiative. How are you helping them find that inspiration and then give it legs? How do professionals educate themselves, stay up to date on trends and hone their skills? While the internet may not be the final answer for each of these questions, it is oftentimes the enabler in finding the courses, events and training providers that eventually do teach them. With the YouTube search box beckoning, I began searching on beginner guitar lessons. It was amazing to see how many useful videos were posted there: basic videos, advanced videos, how to play certain songs, and a variety of instructor personalities and musical styles. I ended up choosing one particular instructor to follow. Their free YouTube videos extend to a comprehensive paid course on their website. Many people still scoff at the idea of blogs and Twitter, but these have become essential tools for education. Many brands are taking this a step further and creating online classes and entire curricula to educate those in their markets. Some of these can be online-only offerings, while others can be a mix, such as MediaBistro’s impressive array of courses. Those in small niche markets are looking to expand and hone their skills – how can you enable them to do that? Even if you don’t create courses, how can you connect them to the best education out there? Can you partner with those businesses, and create a new newsletter or webcast product out of it? Can you use tools like LinkedIn, Twitter or a blog be used to extend the value of these courses, and better connect those who sign up for them? How do those in your industry discover hard-to-find information – questions that haven’t been answered in articles by traditional media? Increasingly, they turn to the web to ask the question, and rely on others to help them uncover the mystery. Enabling these conversations is now a primary role that a media brand can have. 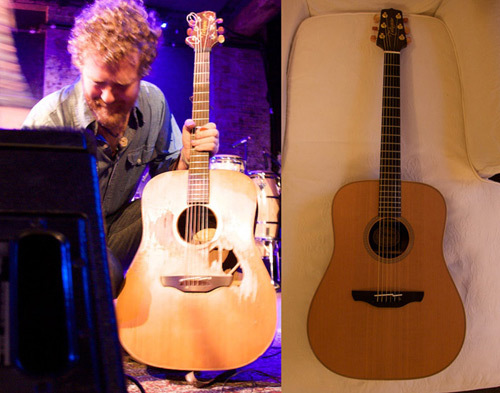 I wanted to buy an acoustic guitar, and looked no further than two of my favorite musicians: it turns out that both Glen Hansard from The Swell Season and Bruce Springsteen play Takamine acoustic guitars. I decided to get the exact model that Glen uses, but this information wasn’t easy to find. It’s a discontinued model, so I kept searching forums, blogs, YouTube and the web to find the answer. I found the answer through conversations in forum comments & blogs, not in a more traditional resource like articles or even Wikipedia. Others had the same question I did, and had already gone back and forth via social media to uncover the mystery. All indications pointed to the Takamine NP-15, but no one could confirm it with certainty. So, early on New Years eve (my obsessions don’t recognize holidays), I emailed someone who had posted a blog entry about meeting Glen and the man who had worked on Glen’s guitar. Amazingly, he emailed back early on New Year’s morning. He gave me the phone number and email address for the man who had done extensive repair work on Glen’s guitar! I shot off an email to him at 9am Jan 1st, and received a response at 11am. Incredible. He confirmed that Glen did indeed play the NP-15 and shared some details on the work he did on it. 18 years ago this never could have happened. Not just because tools like email weren’t as widely adopted, but because at every level, people are more open to connecting and sharing online. 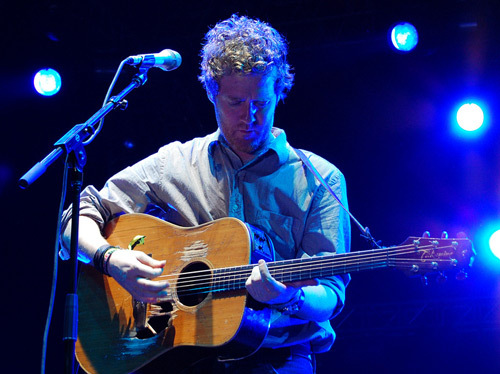 Even the artists themselves are on social media: here is Glen Hansard’s Twitter feed. Not being on Twitter or LinkedIn isn’t any sort of crime. But if you are someone who has mastered a skill or if you are the hub for information on a certain topic, these tools allow you to enable more people and extend the value you create in the world. Since the NP-15 is hard to find, I also began searching for a Takamine that Bruce Springsteen made famous, the EF341sc. Within a couple of days, I found a slightly older version of it on Craigslist at a reasonable price. The owner and I met up in the city and made the transaction. It was especially cool because the owner was Lyris Hung, a violinist who has played with Bono, Jay-Z, Dave Mathews, Cheryl Crow and others. Very cool to meet her, and an example of how something that started online turned into an in-person connection. A few weeks later, someone listed an N-15 on eBay, which is REALLY close to being an NP-15. So, I bought that guitar too. A beautiful piece and very different sound from my other guitar, so I’m glad I got it. All of these connections happened online, and even though they were enabled by larger platforms, they were still direct transactions between two individuals. Researching across a variety of online destinations, but making a purchase at only one of them. So when I went to purchase a capo for my guitar, I used a variety of resources, including reviews on Amazon.com, MusiciansFriend.com, GuitarCenter.com, YouTube.com, Flickr.com and some forum searches. In the end, I ordered the capo from an Amazon marketplace seller, so it was a transaction between a small business and myself, with Amazon enabling things. I still think it’s cool that I can find so many expert opinions without ever leaving the house. This simply wasn’t possible 20 years ago. Back then, I would perhaps have a single recommendation from a friend, and be steered in one direction or another by the sales clerk at Sam Ash. Today, I can read dozens of detailed reviews on something small like a particular model of a capo. 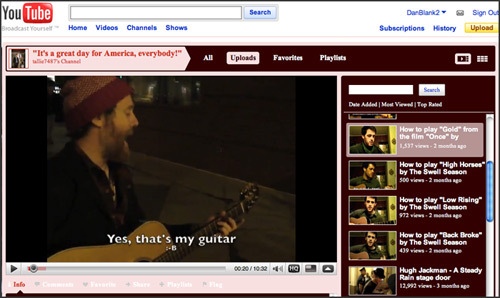 I can watch videos of people using the capo on YouTube. I can make a more educated decision. Another tool I bought for my lessons was the GuitarToolKit iPhone app. This $10 app was purchased solely on the many reviews that accompanied it the iPhone app store. It’s interesting how mindshare is spread across so many platforms and so much media. So now I go to my iPhone for a metronome, for chord charts, and even for a tuner. This entire process is about like-minded individuals connecting to each other, through reviews, forums, blogs, classifieds, etc. And these steps are becoming essential in any purchase, offline or online. I even found a guy on YouTube who is uploading video after video of lessons on how to play Swell Season songs. We started emailing, and ended up meeting when the band played at Radio City Music hall. Just two fans sharing their appreciation for a band. 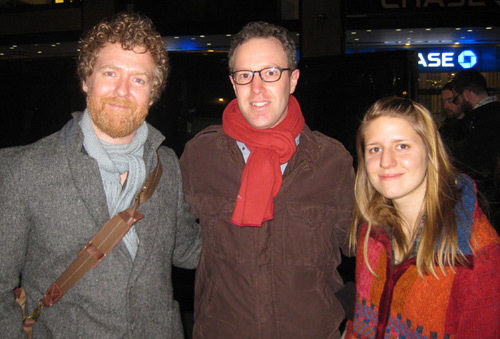 I saw the Swell Season at two shows that week. A day after each event, YouTube had videos from each of them, which helped me recapture the event, and for the thousands of fans who weren’t there, they were able to experience these in-person events in an online environment. They could also connect directly with the content creator who had shot and uploaded the videos. And that is the critical link between web and in-person. That is why there is no such thing as a print strategy or a social media strategy – a business must have a CUSTOMER strategy that takes advantage of all channels and uses them as a single system.